WASHINGTON CITY – The Washington City Council was given its first look at a proposed active transportation plan Tuesday that is anticipated to provide a safer, friendlier and much more interconnected infrastructure for pedestrians and cyclists over the next 20 years. So why does walking and bicycling matter? Tim Millar, of Atla Planning and Design, asked the City Council as he presented them with a draft of the proposed plan and the studies that helped create it. Among the reasons he gave for why walking and cycling – both known elements of active transportation – is important, is because it provides an increase in transportation options, as well as independence and freedom of choice. It also promotes a healthier community and higher quality of life as walkers and cyclists engage in physical activity as they go from point A to point B. Increased walking and cycling also reduces vehicle use, thus bettering the air quality in addition to reducing costs associated with vehicle use. According to data presented in the draft plan, 38 percent of Washington City’s population – about 3,800 people – are under 16 or over 70. These individuals are either unable or less likely to drive, leaving them as potential candidates for walking and bicycling. Nearly 93 percent of all trips within Washington City are done by car, with the remainder done on foot or by bicycle. Of all those trips, 36 percent are 2 miles or less. In relation to crashes involving people walking and cycling, they made up 2.3 percent of all crash incidents since 2010, Millar said. “So according to these figures, it’s actually safer to walk and bike than it is to drive,” Millar said. Washington City currently has 94.5 miles of combined paved and unpaved trails and shared roadways. Future recommendations would offer an interconnected system of a combined 224 miles. A majority of Washington City roads – nearly 90 percent – are currently considered comfortable for bicycle use. Yet, these areas are spread throughout the city and are either not connected or are separated by busy intersections, Millar said. Future implementation of the active transportation plan would provide better connectivity throughout the town, Millar said. Nearly 600 Washington City residents participated in a survey related to the active transportation plan, Millar said. Those respondents said major barriers to their cycling in the city were related to insufficient or unsafe shoulders and cycling facilities, aggressive drivers and unsafe intersections. Pedestrians who walk showed similar concerns, though the majority surveyed said they felt safe when walking in Washington City. Better connectivity between various destinations in the city, like parks and commercial areas, was also desired by respondents. Up to 80 percent of future active transportation infrastructure would include what Millar called “high-comfort” facilities for cyclists. 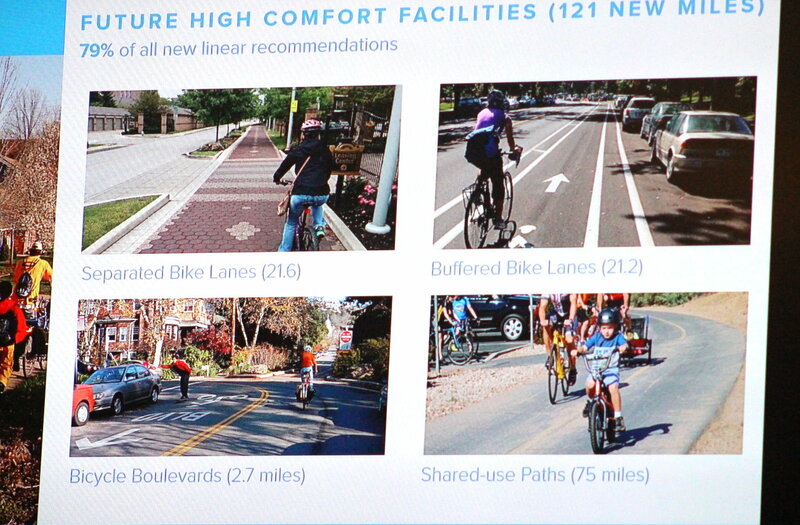 These are bike paths that most people was feel comfortable riding with their family on, Millar said, as they are ones that help cut down on the potential worries cyclists may otherwise have while out riding. Separated bike lanes – lanes separated from the road by a physical barriers. In the cases where there is a buffer, either physical or outlined on the road, cyclists feel safer due to the added space and separation from passing vehicle traffic, Millar said, adding that as motorists also get used to seeing more cyclists along the road, they tend to drive slower and be more aware of their surroundings. Putting a buffered bike lane along Telegraph Street from the western city limit to 500 East. Bike lanes on 300 East from Telegraph Street to 2000 South. Councilman Jeff Turek noted comments he gets about cyclists who tend to ride side-by-side in the road rather than single file. The action can slow and impede traffic and does little to engender a sense of civility and brotherhood with some motorists. A part of the proposed active transportation plan does recommend education courses, community events and other programs to help raise public awareness surrounding active transportation in the city. 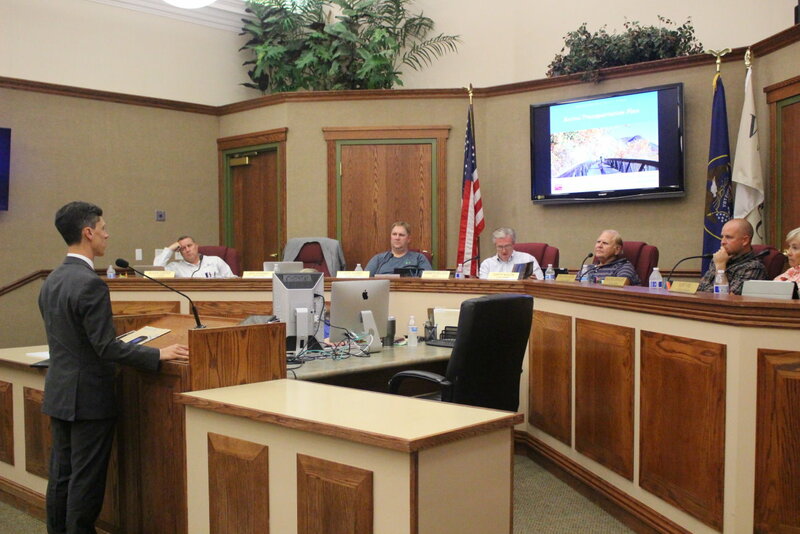 The overall plan is designed not only to provide better infrastructure and connectivity within Washington City, Millar said, but also to provide connections to neighboring cities like St. George and Hurricane, and the county as a whole. This is a prospect Neilson said he is excited about. “I think it will enhance all of (the communities) in the county,” Neilson said. A public hearing on the active transportation plan is anticipated to be held during a council meeting in September. It is great to see that the city recognizes that their are opportunities for improving flow/safety of bicycles within city limits. After almost two years of commuting from Coral Canyon to points south, along Telegraph, there were several close calls by cars/trucks crossing into the modest size bike lane, especially south of Washington Parkway. The sidewalk (where it exists) became a safer alternative, to avoid contact. The 3 foot “buffer” that drivers are supposed to provide as they pass cyclists is not generally followed. Dedicated biking/walking paths are a terrific feature of Saint George, and a section of Washington City along the Virgin River. It is unlikely these expensive pathways will be expanded, so creating a safe bikelane, and buffer, would be huge, on existing roadways. Washington County has a phenomenal climate for recreational cycling, and it is in everyone’s interest to reduce the number of car trips taken. Washington city is on the cutting edge of transportation issues.. Like building a freeway off ramp through downtown.. Go dog town! How about expanding the public bus line?? ?